Legalize Democracy movie was great. Posted on February 19, 2014 by Charly | Comments Off on Legalize Democracy movie was great. Call me if you want to show it or if you want us to make a presentation to your organization. Comments Off on Legalize Democracy movie was great. December 3 is the Global Day of Action against Toxic Trade Agreements. There will be actions in countries around the world, including a Sacramento Action planned by organizers from Nevada County. That evening at 6:30, Sharon Delgado and Emanuel Sferios will speak at Tomes Bookstore on “Toxic Trade Agreements, Corporate Globalization, and the Movement for Global Justice.” Tomes is at 671 Maltmann, in Grass Valley. People working on various peace, justice, and environmental issues need to know how global trade rules impact their areas of concern. 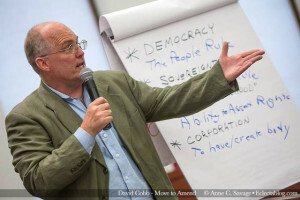 This introductory presentation and conversation is geared toward people who want to better understand toxic trade agreements such as the proposed Trans-Pacific Partnership (TPP), the larger project of global corporate rule, and peoples’ movements to transform the global system through participatory democracy. Supreme Court rulings such as Citizens United grant and extend civil rights to corporations and allow them to dominate culture, economics and government in the United States. The World Trade Organization and so-called “free trade agreements” such as NAFTA and the proposed TPP extend the power of corporations on a transnational and global scale. They allow corporations to write the rules for governments to follow, not just about trade but in matters of domestic law. This is an initial presentation and conversation, designed to get us talking about what we might want to do locally to highlight this issue and link it to the other work we are doing. 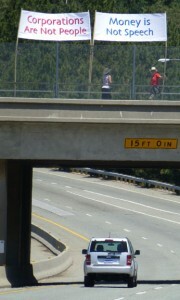 It is being sponsored by Nevada County Move to Amend. For more information call 265-5976. First of all the Banner Grange folks were wonderful. We drew a big crowd, over 150 and received generous donations. Many new faces. Everyone was energized by David’s presentation. David Cobb – Coming to Nevada County! Posted on October 26, 2013 by Charly | Comments Off on David Cobb – Coming to Nevada County! Tickets are $5.00 and are available at the Brier Patch Food C0-0p and at the door. No one will be turned away for lack of funds. Please invite folks of all political strips. This movement to pass the “We the People Amendment” is non-partisan and for the benefit of all citizens. Comments Off on David Cobb – Coming to Nevada County! The town gave us a great reception. 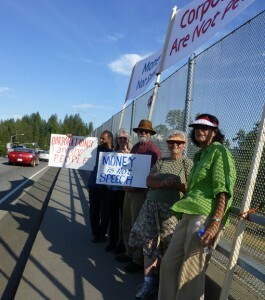 On lookers were glad to know there is a solution to the corporate and big money take over of our government! The weather was hot and the streets were crowded with on lookers. We had a blast. Tagged We got a huge positive responce and no negitive ones from the car and truck drivers on Brunswick and CA hwy 20/49! We were there from 8am tell 6pm and stayed full staffed by our amenders. The rights protected by the Constitution of the United States are the rights of natural persons only. Artificial entities established by the laws of any State, the United States, or any foreign state shall have no rights under this Constitution and are subject to regulation by the People, through Federal, State, or local law. The privileges of artificial entities shall be determined by the People, through Federal, State, or local law, and shall not be construed to be inherent or inalienable. Federal, State, and local government shall regulate, limit, or prohibit contributions and expenditures, including a candidate’s own contributions and expenditures, to ensure that all citizens, regardless of their economic status, have access to the political process, and that no person gains, as a result of their money, substantially more access or ability to influence in any way the election of any candidate for public office or any ballot measure. Federal, State, and local government shall require that any permissible contributions and expenditures be publicly disclosed. The judiciary shall not construe the spending of money to influence elections to be speech under the First Amendment. We held several successful large (100 to 200 people) educational events. We presented a resolution supporting an amendment to the Nevada City Council, which passed it unanimously. We tabled at several events and received many petition signatures. We decided on wording for a resolution we plan to present to Grass Valley City Council and to the Nevada County Board of Supervisors. We had these cards made to hand out everywhere. We created a Nevada County – Move to Amend FaceBook page, a google groups email list and this web site. We had a great 10 hour long freeway banner event with spots on both local radio channels, to keep the message alive. 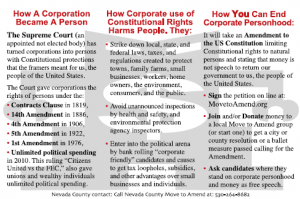 We, the People of the United States of America, reject the U.S. Supreme Court's Citizens United ruling, and move to amend our Constitution to firmly establish that money is not speech, and that human beings, not corporations, are persons entitled to constitutional rights. Sign the Petition on Move to Amend's main site. 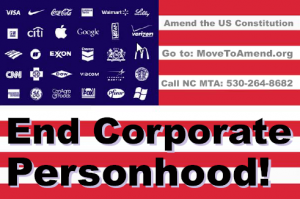 Nevada County Move to Amend is the Nevada County affiliate of the national movement to overturn the Citizen's United Supreme Court Decision and end corporate personhood. You can learn more about us on our About page. Bubba Parade We got a huge positive responce and no negitive ones from the car and truck drivers on Brunswick and CA hwy 20/49! We were there from 8am tell 6pm and stayed full staffed by our amenders. The next Move to Amend meeting will be Tuesday, Feb. 24th at 5:30 at Tomes, 671 Maltman Dr., Grass Valley. Come get involved in our self-education program (or just listen) and help plan how we should move forward on building the grassroots movement to amend the Constitution. California State Grange Convention passes resolution calling for the Amendment! loss plan on The next Move to Amend meeting will be Tuesday, Feb. 24th at 5:30 at Tomes, 671 Maltman Dr., Grass Valley. Come get involved in our self-education program (or just listen) and help plan how we should move forward on building the grassroots movement to amend the Constitution. Metal Slug gratis on the Nevada City Constitution Day Parade was a big success! internet on the Nevada City Constitution Day Parade was a big success!